A girl can tell a lot about how you will treat her by how you treat your mother and sister. 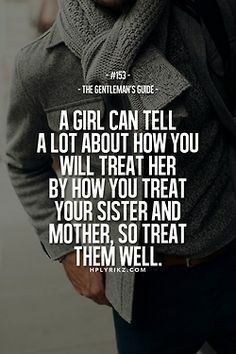 So treat them well. Germs of rudeness are everywhere, and it’s as easy to catch other people’s negativity as it is to catch the sniffles. — Shaunacy Ferro, Is Rudeness Contagious? Hold the door, say please, say thank you. Don't steal, don't cheat, and don't lie. I know you got mountains to climb but always stay humble and kind. 'Only if you say please' is a statement that’s really only okay for a parent to say to a child, in the process of teaching said child manners. It’s not okay to chastise other adults with it.